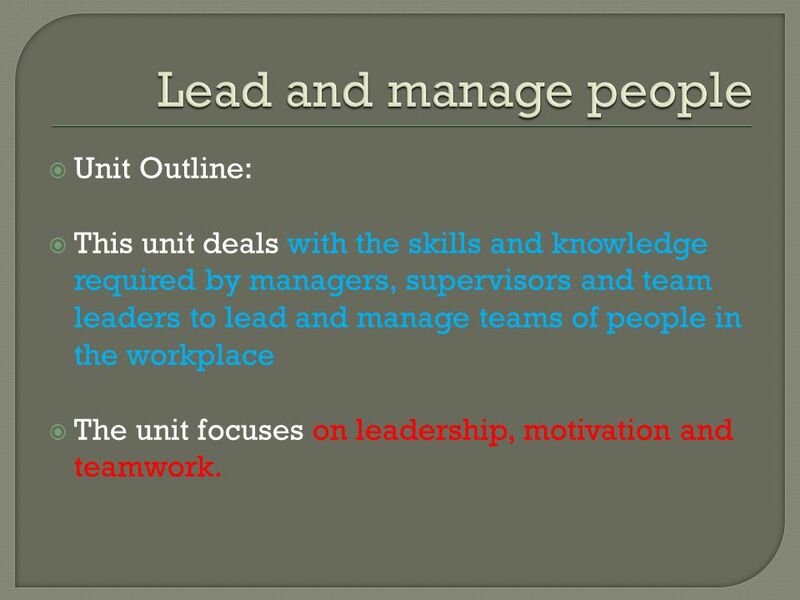 This unit deals with the skills and knowledge required by managers, supervisors and team leaders to lead and manage teams of people in the workplace The unit focuses on leadership, motivation and teamwork. 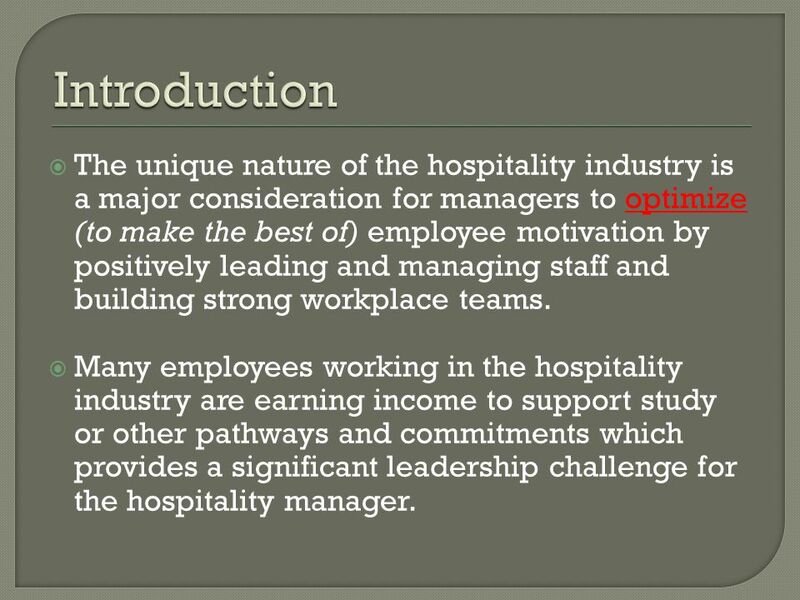 3 Introduction The unique nature of the hospitality industry is a major consideration for managers to optimize (to make the best of) employee motivation by positively leading and managing staff and building strong workplace teams. Many employees working in the hospitality industry are earning income to support study or other pathways and commitments which provides a significant leadership challenge for the hospitality manager. 4 Cont. Many of them are working as casual employees, they are often young, diverse, and have no career ambition in the industry. Hospitality industry is a service industry in which optimal customer contact is the ideal & teamwork is essential in creating a positive and enjoyable experience. 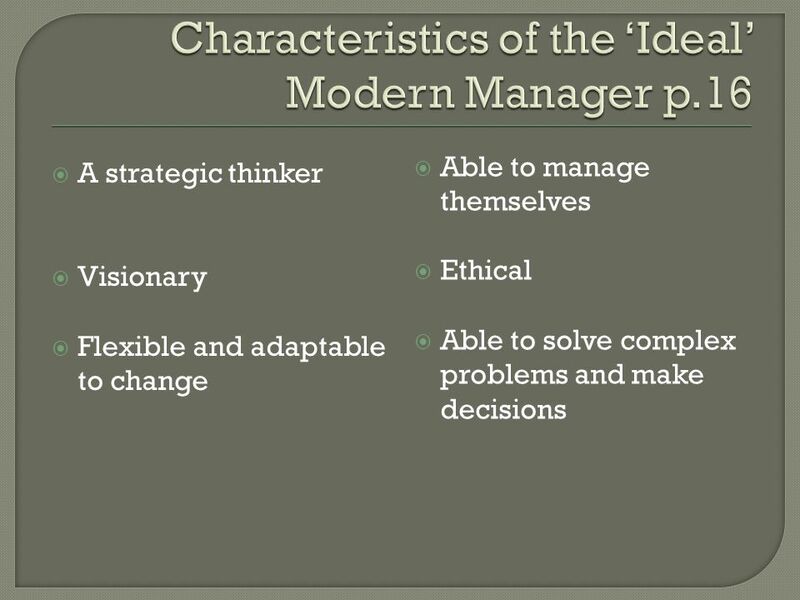 Therefore, the manager’s challenge is to meet the motivational needs of his staff, career-minded supervisors and frontline staff, as well as those of the less committed transient employees. 6 Leader A leader is a person who guides or directs others. Leaders are the heart of the business; they influence others, motivate and persuade people to achieve the goals of the business. 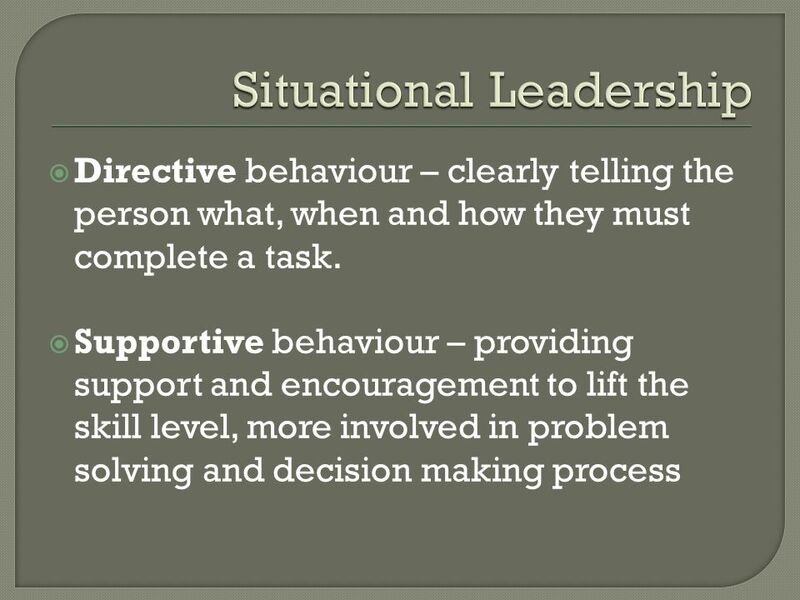 It is important to understand that team leaders or supervisors work with a team in supportive workplace relationships. 7 Cont. 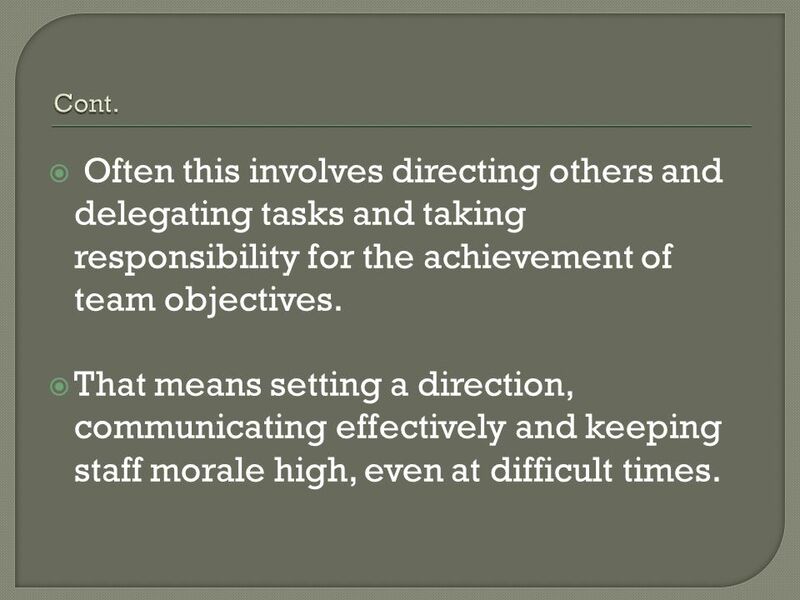 Often this involves directing others and delegating tasks and taking responsibility for the achievement of team objectives. That means setting a direction, communicating effectively and keeping staff morale high, even at difficult times. Authoritarian leaders provide clear expectations for what needs to be done, when it should be done, and how it should be done. There is also a clear division between the leader and the followers. 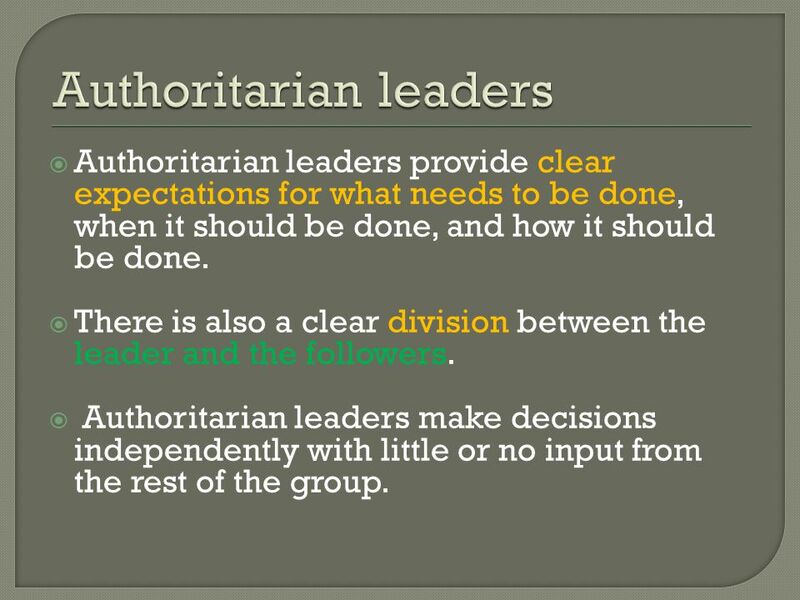 Authoritarian leaders make decisions independently with little or no input from the rest of the group. 13 Cont. 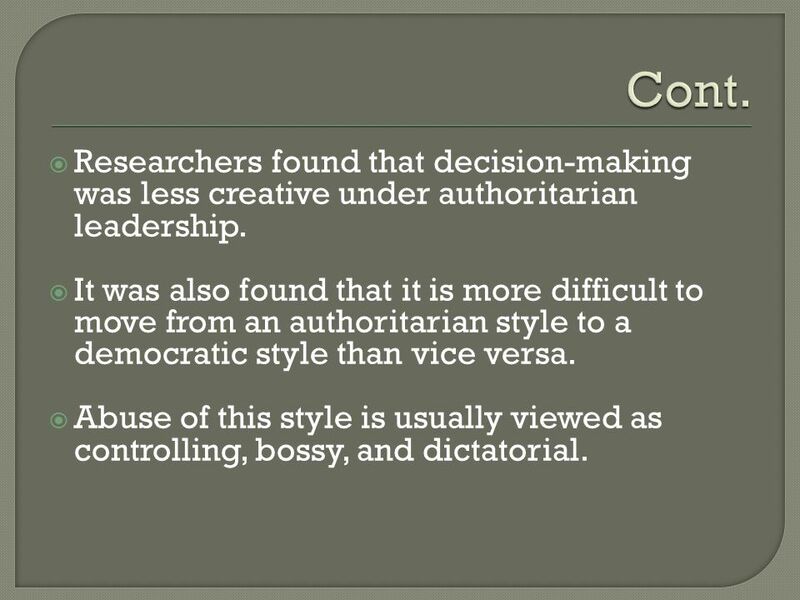 Researchers found that decision-making was less creative under authoritarian leadership. 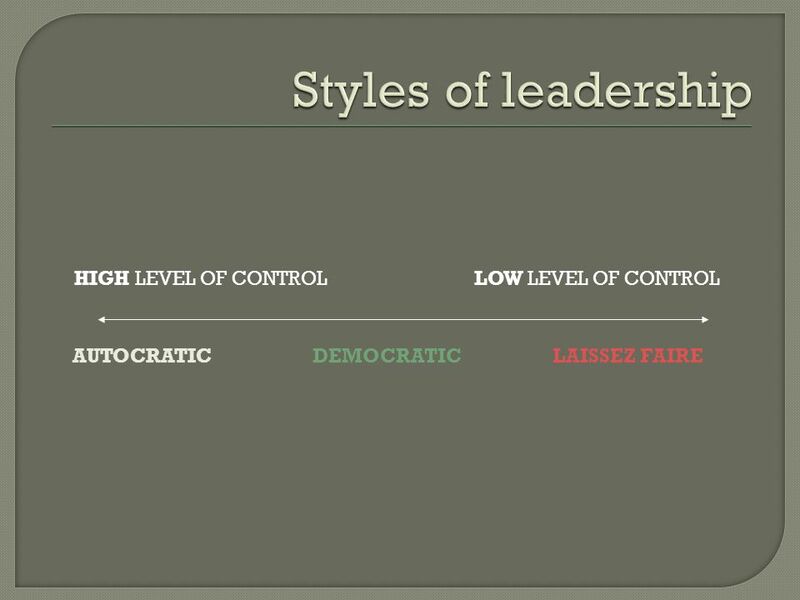 It was also found that it is more difficult to move from an authoritarian style to a democratic style than vice versa. 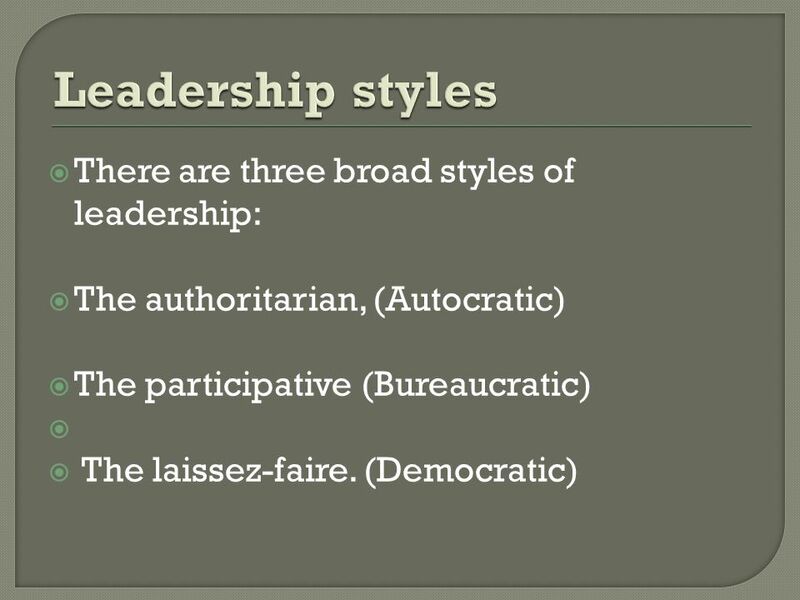 Abuse of this style is usually viewed as controlling, bossy, and dictatorial. 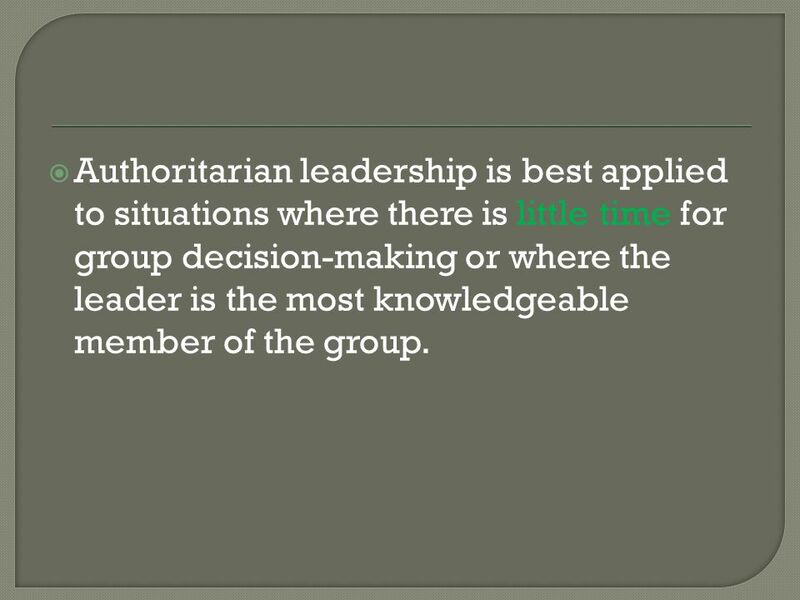 14 Authoritarian leadership is best applied to situations where there is little time for group decision-making or where the leader is the most knowledgeable member of the group. 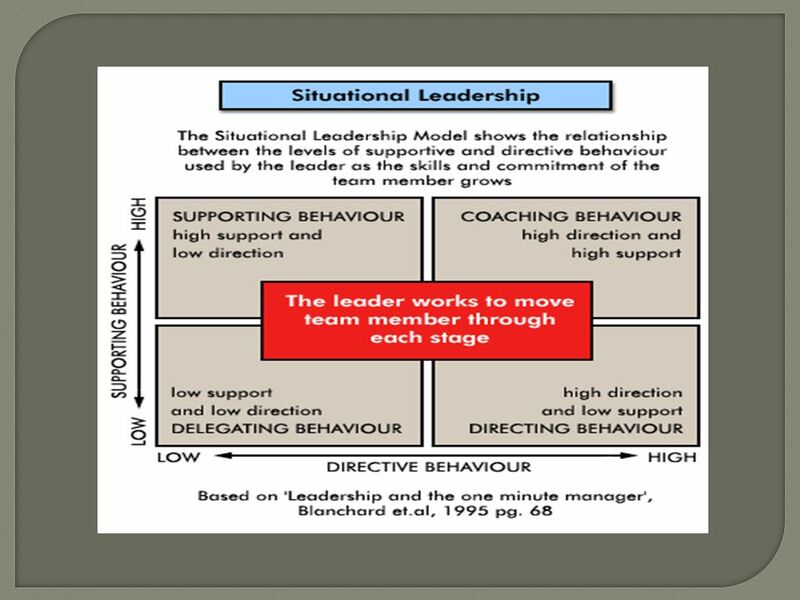 Participative leaders interact with their teams, actively looking for input and encouraging team members to take a direct role in team decision-making. 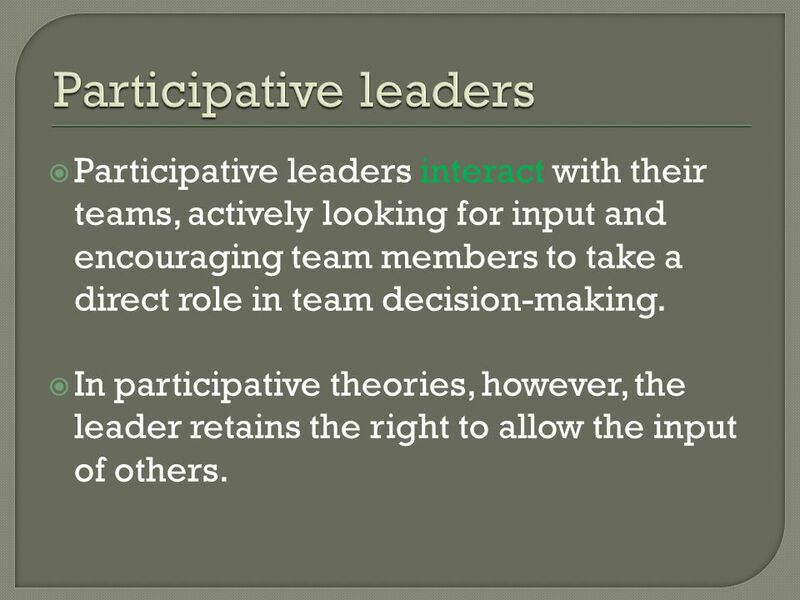 In participative theories, however, the leader retains the right to allow the input of others. 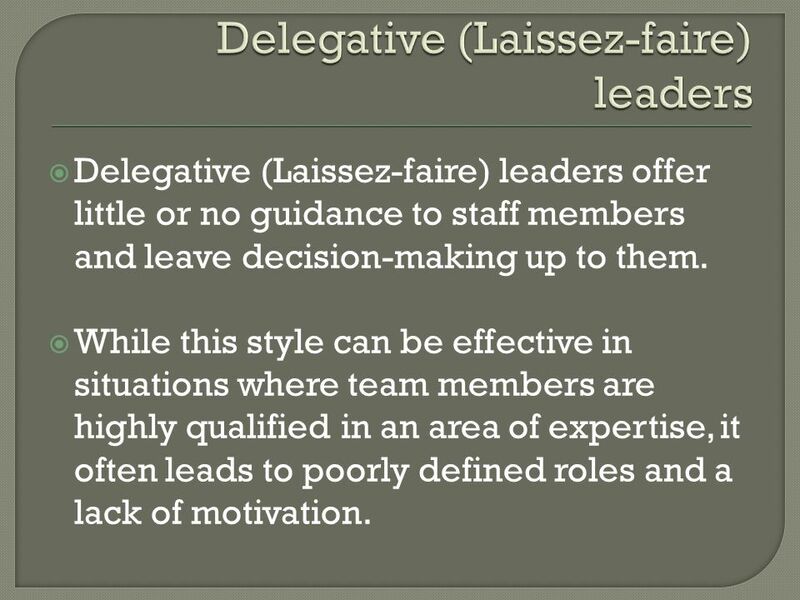 Delegative (Laissez-faire) leaders offer little or no guidance to staff members and leave decision-making up to them. 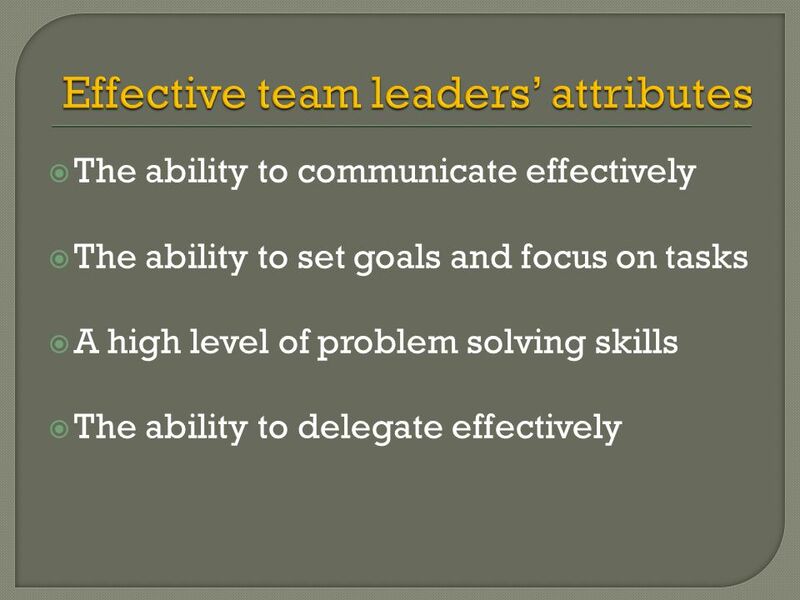 While this style can be effective in situations where team members are highly qualified in an area of expertise, it often leads to poorly defined roles and a lack of motivation. 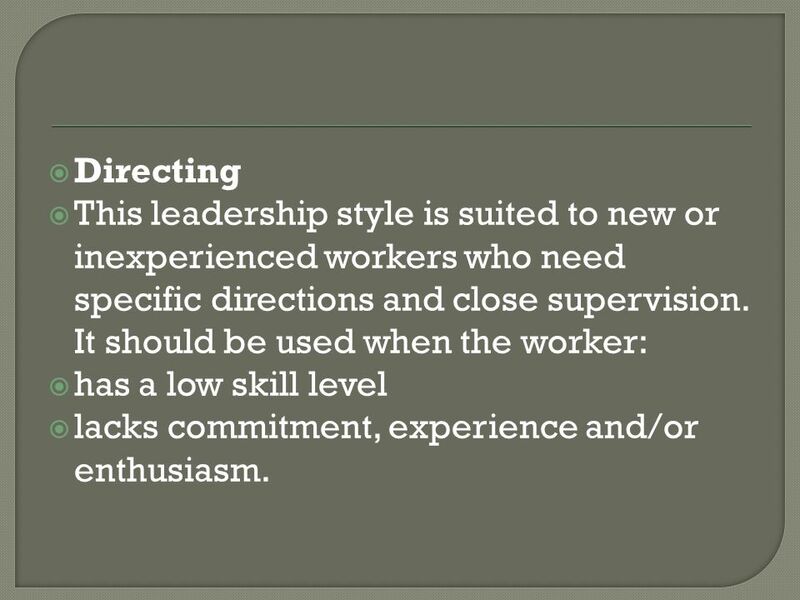 20 Directing This leadership style is suited to new or inexperienced workers who need specific directions and close supervision. 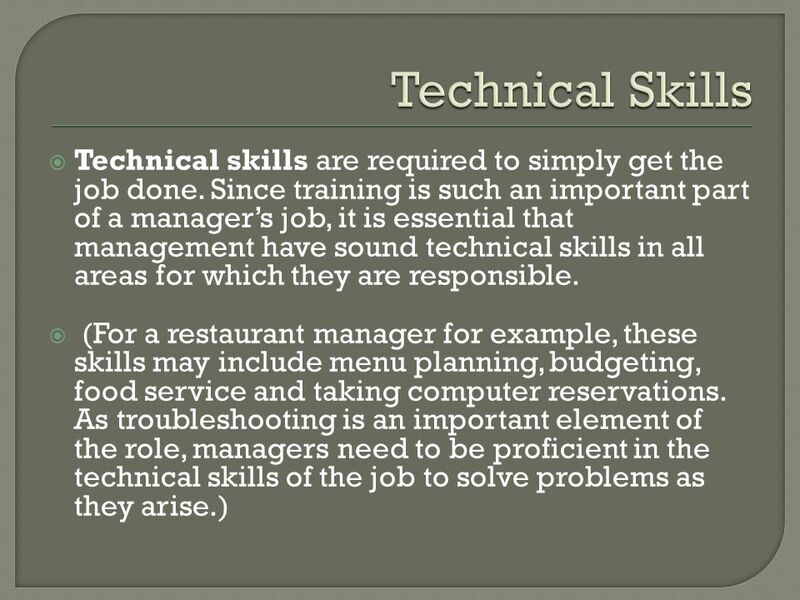 It should be used when the worker: has a low skill level lacks commitment, experience and/or enthusiasm. 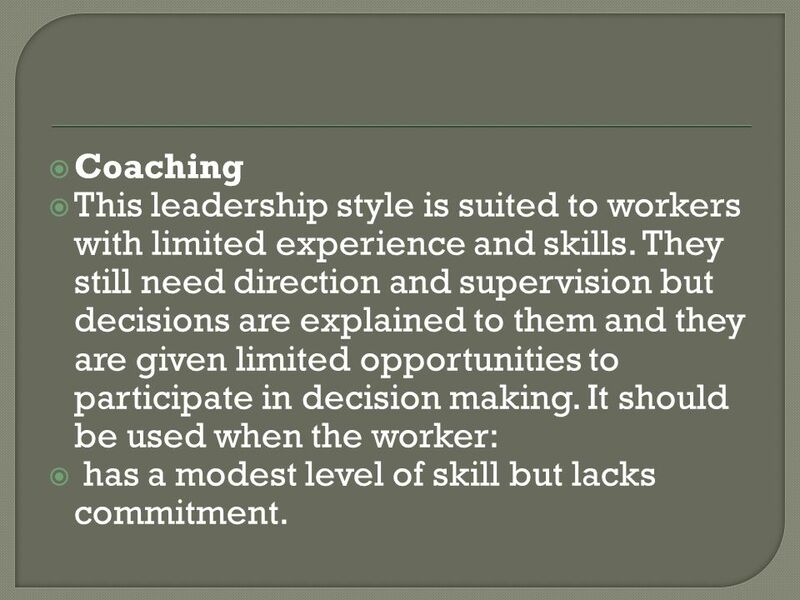 21 Coaching This leadership style is suited to workers with limited experience and skills. They still need direction and supervision but decisions are explained to them and they are given limited opportunities to participate in decision making. It should be used when the worker: has a modest level of skill but lacks commitment. 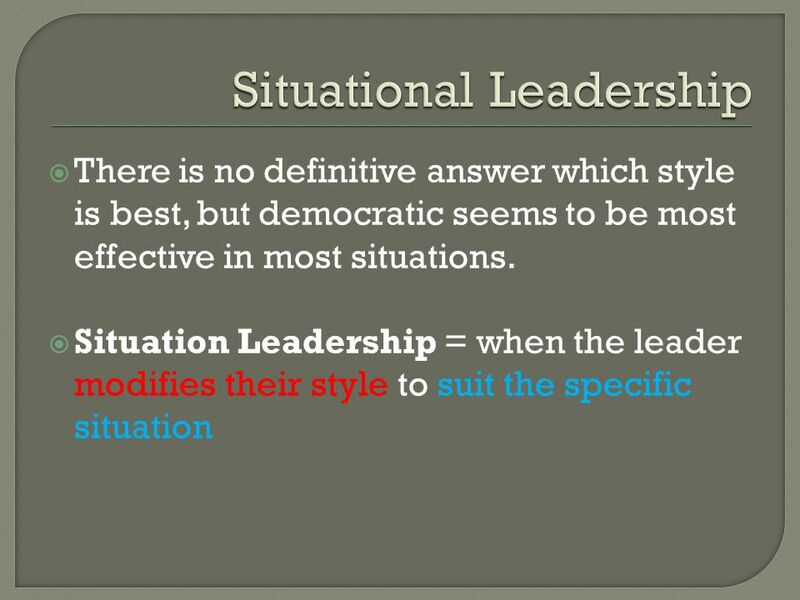 22 Supporting This leadership style is suited to workers that have good skill levels and experience. They don't need close supervision or direction because of their current skills and experience but they need support to build their confidence and motivation. The responsibility for making decisions is also shared with them. 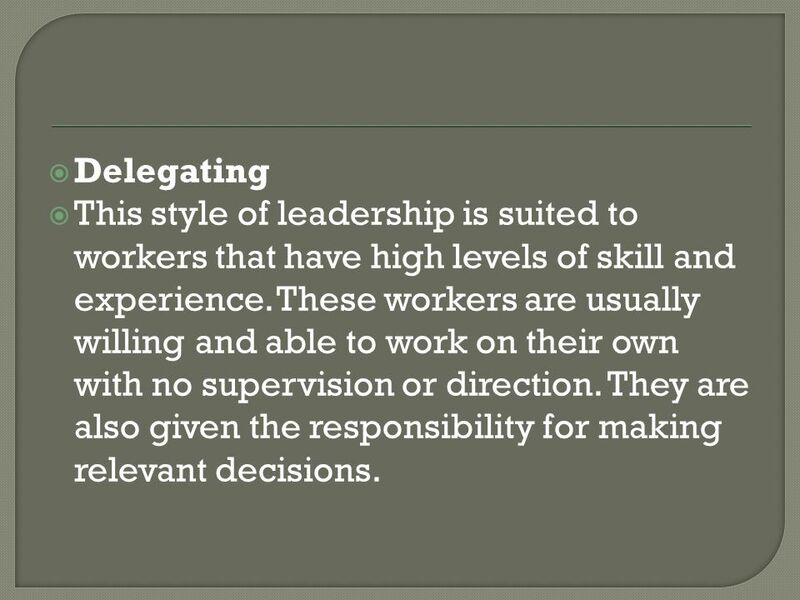 23 Delegating This style of leadership is suited to workers that have high levels of skill and experience. These workers are usually willing and able to work on their own with no supervision or direction. They are also given the responsibility for making relevant decisions. 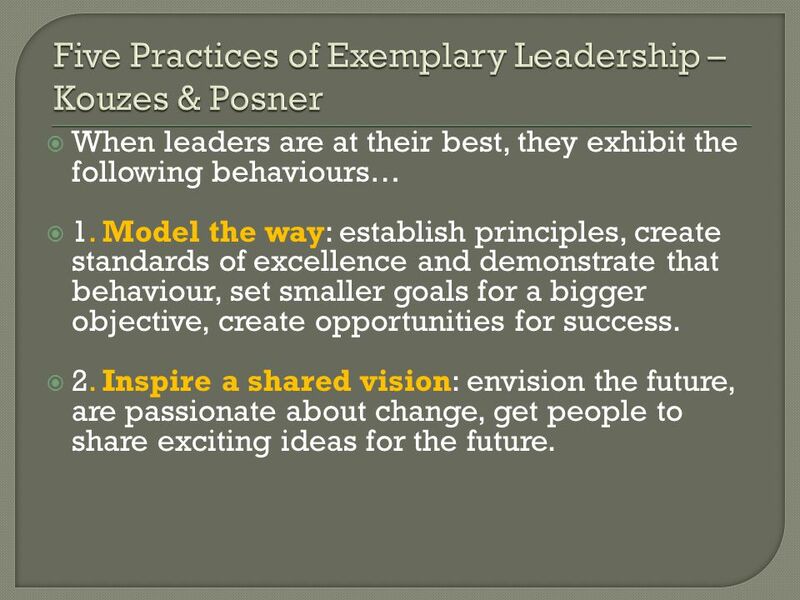 When leaders are at their best, they exhibit the following behaviours… 1. 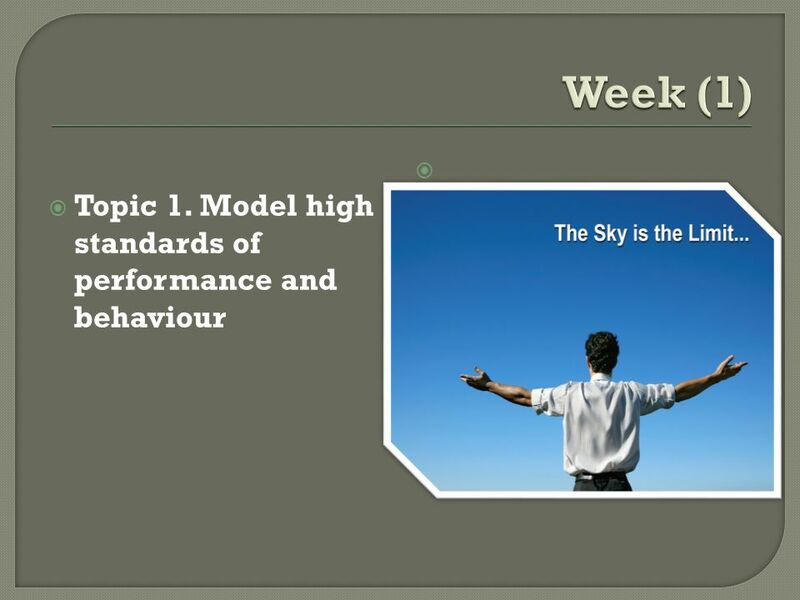 Model the way: establish principles, create standards of excellence and demonstrate that behaviour, set smaller goals for a bigger objective, create opportunities for success. 2. Inspire a shared vision: envision the future, are passionate about change, get people to share exciting ideas for the future. Be the person others choose to follow. Provide vision for the future. Provide inspiration. Make other people feel important and appreciated. Live your values. Behave ethically. 28 Cont. Set the pace through your expectations and example. 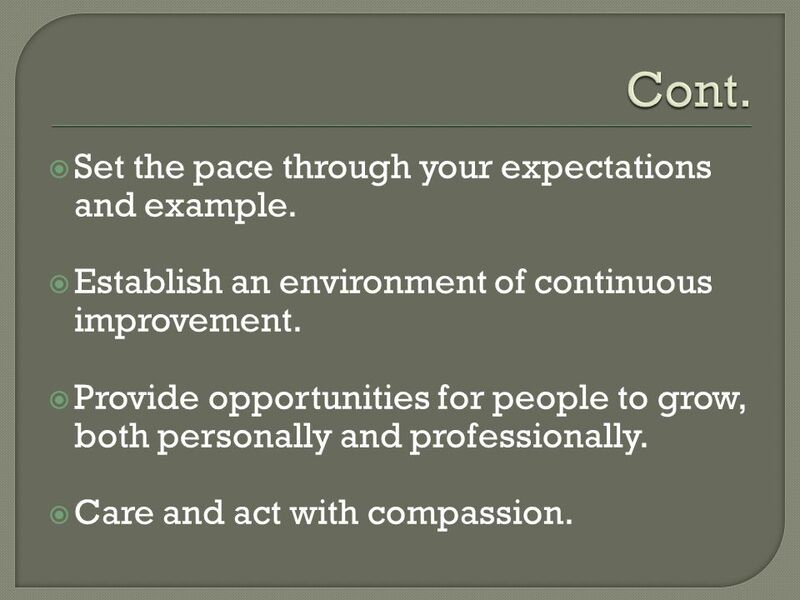 Establish an environment of continuous improvement. Provide opportunities for people to grow, both personally and professionally. Care and act with compassion. 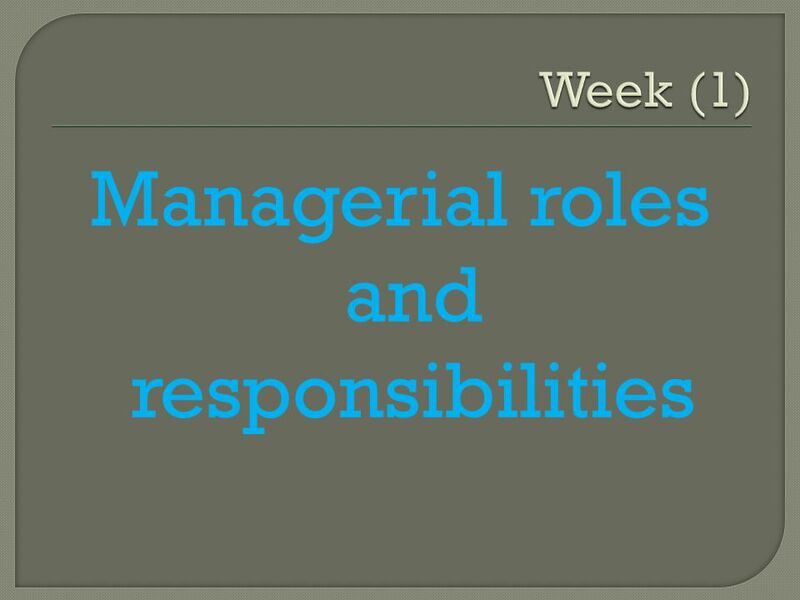 29 Supervision Supervision means that an individual is in charge of providing direction and oversight for other employees. The successful supervisor provides recognition, appreciation, training and feedback to reporting employees. 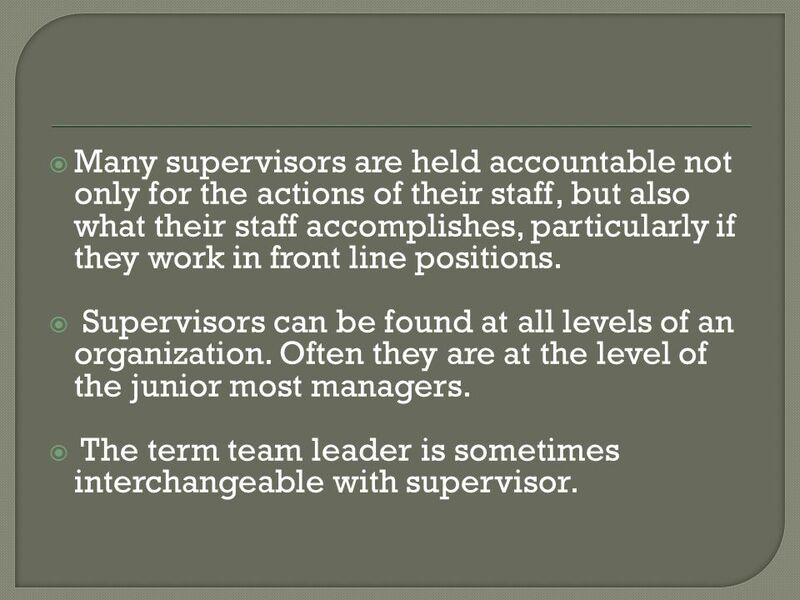 30 Many supervisors are held accountable not only for the actions of their staff, but also what their staff accomplishes, particularly if they work in front line positions. 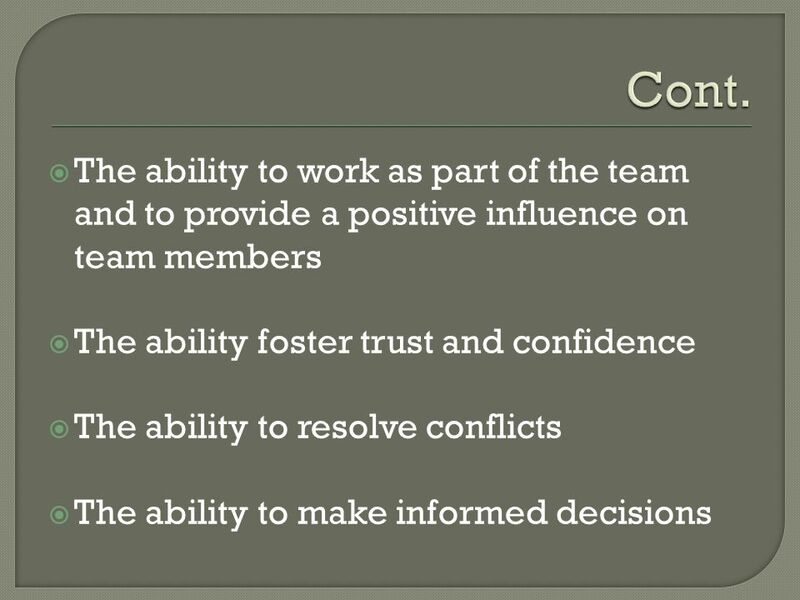 Supervisors can be found at all levels of an organization. Often they are at the level of the junior most managers. 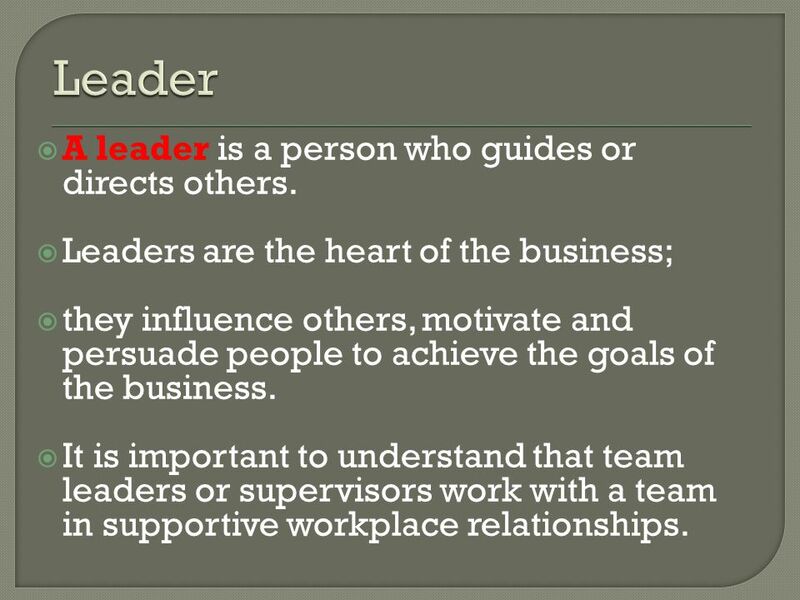 The term team leader is sometimes interchangeable with supervisor. 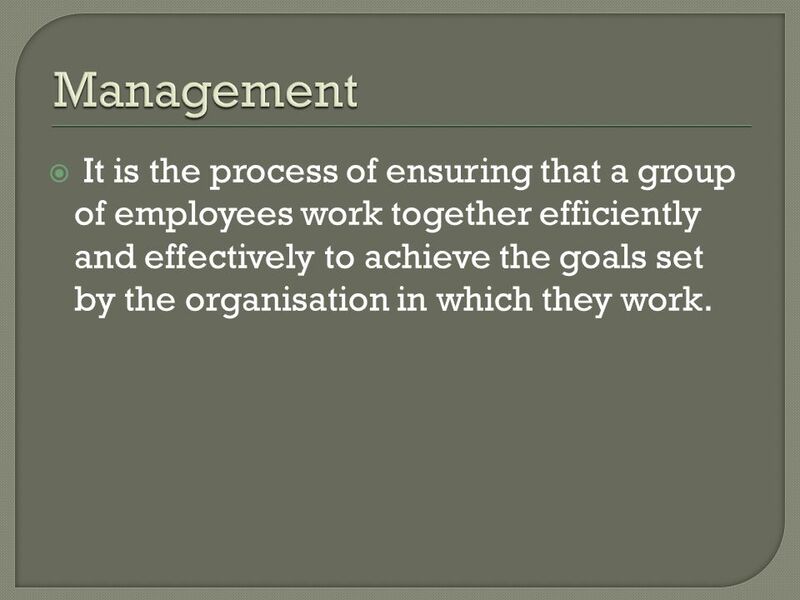 34 Management It is the process of ensuring that a group of employees work together efficiently and effectively to achieve the goals set by the organisation in which they work. 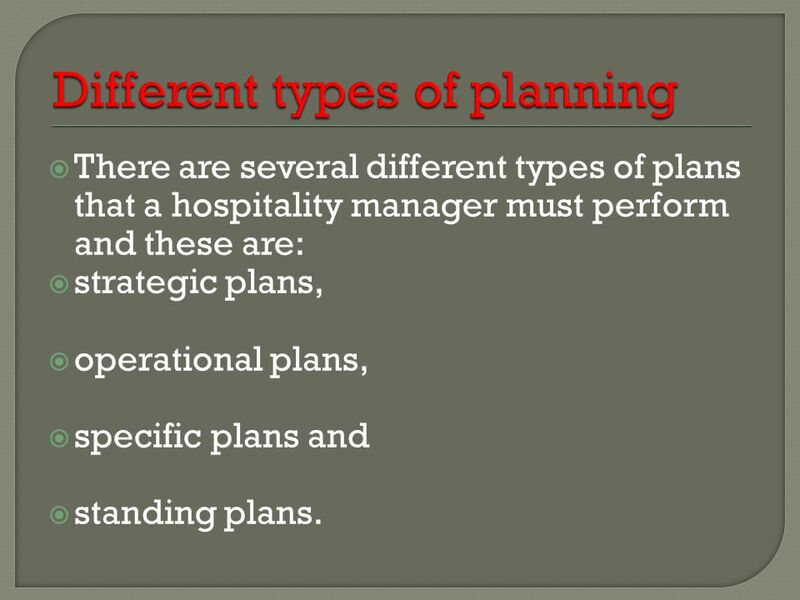 There are several different types of plans that a hospitality manager must perform and these are: strategic plans, operational plans, specific plans and standing plans. 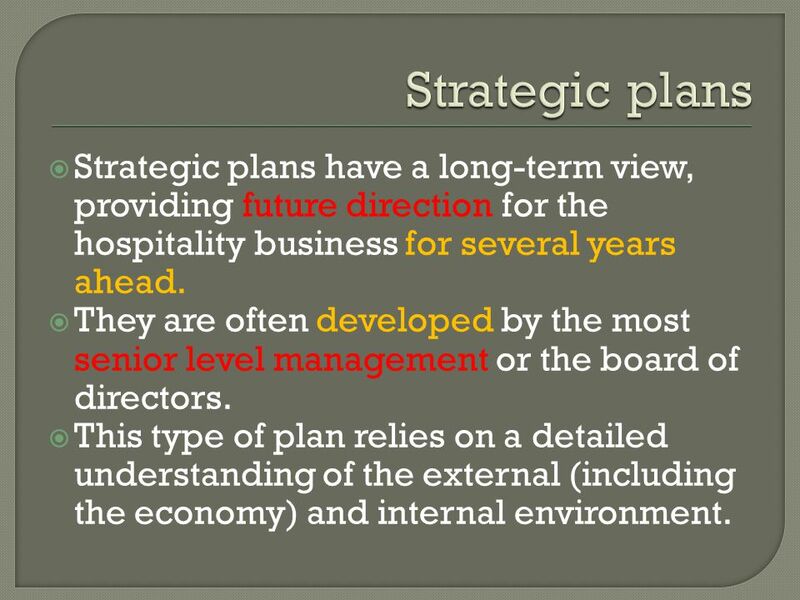 40 Strategic plans Strategic plans have a long-term view, providing future direction for the hospitality business for several years ahead. 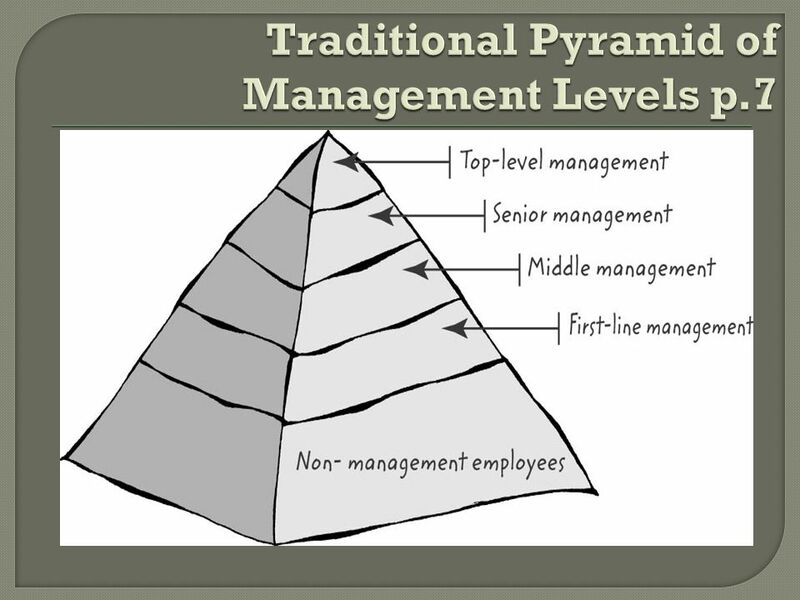 They are often developed by the most senior level management or the board of directors. 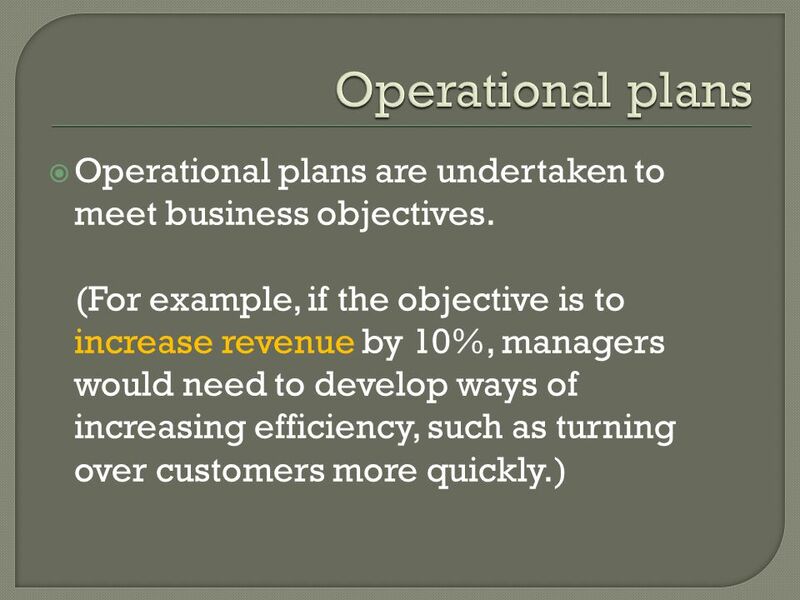 This type of plan relies on a detailed understanding of the external (including the economy) and internal environment. 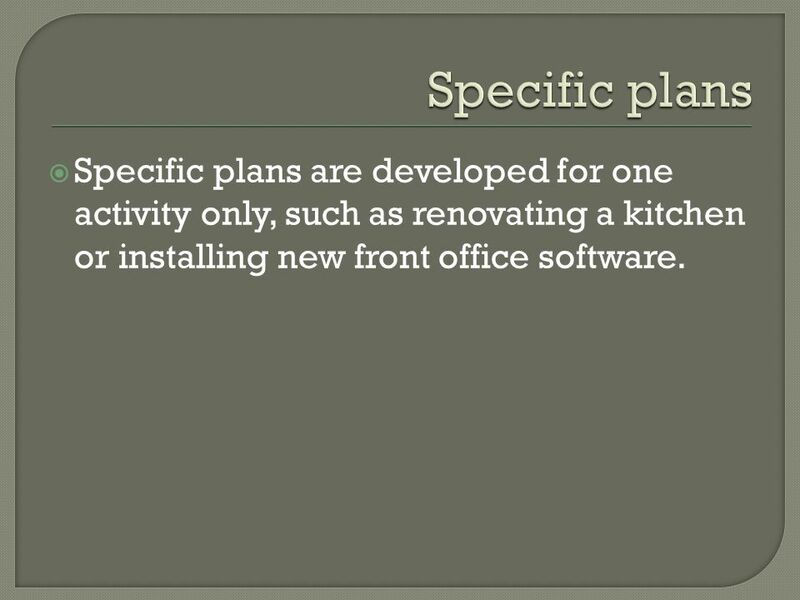 42 Specific plans Specific plans are developed for one activity only, such as renovating a kitchen or installing new front office software. 43 Standing plans Standing plans are in place for specific situations such as bomb threats and fires. Such plans cover evacuation and are strongly influenced by regulations and standards (e.g. 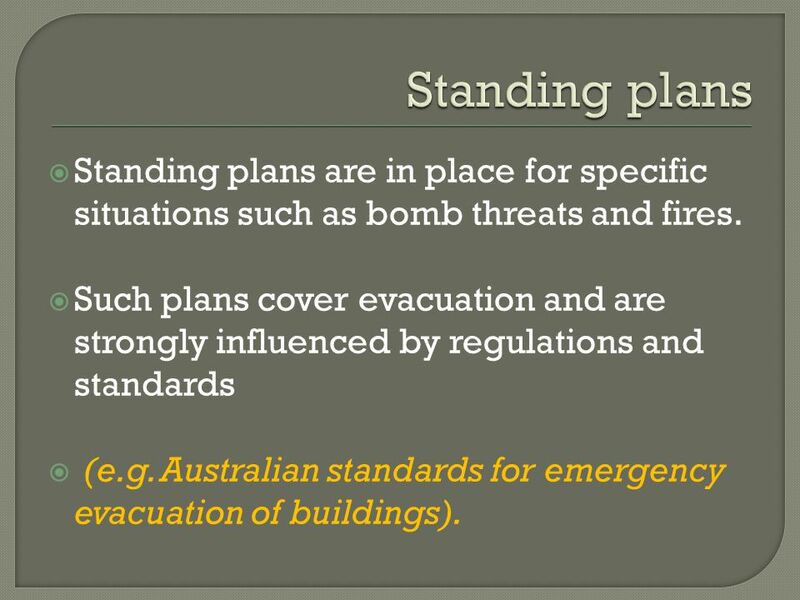 Australian standards for emergency evacuation of buildings). 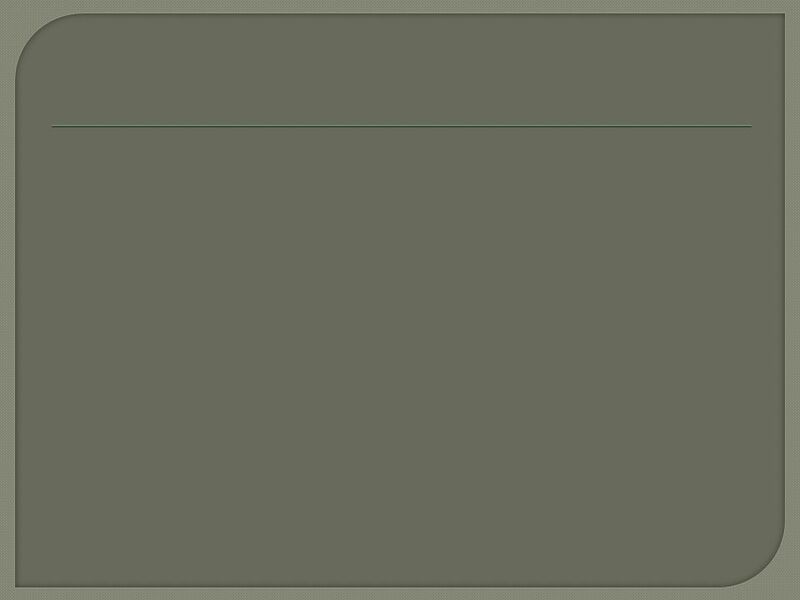 44 2. 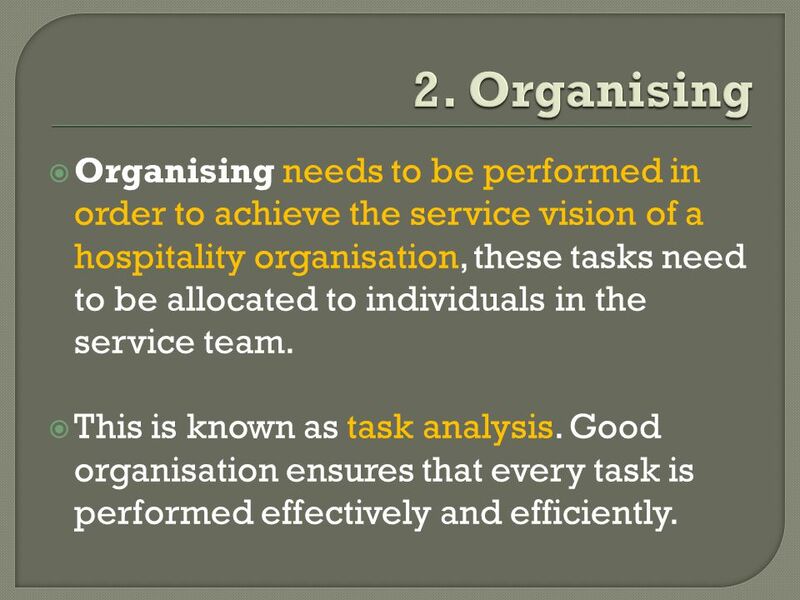 Organising Organising needs to be performed in order to achieve the service vision of a hospitality organisation, these tasks need to be allocated to individuals in the service team. This is known as task analysis. 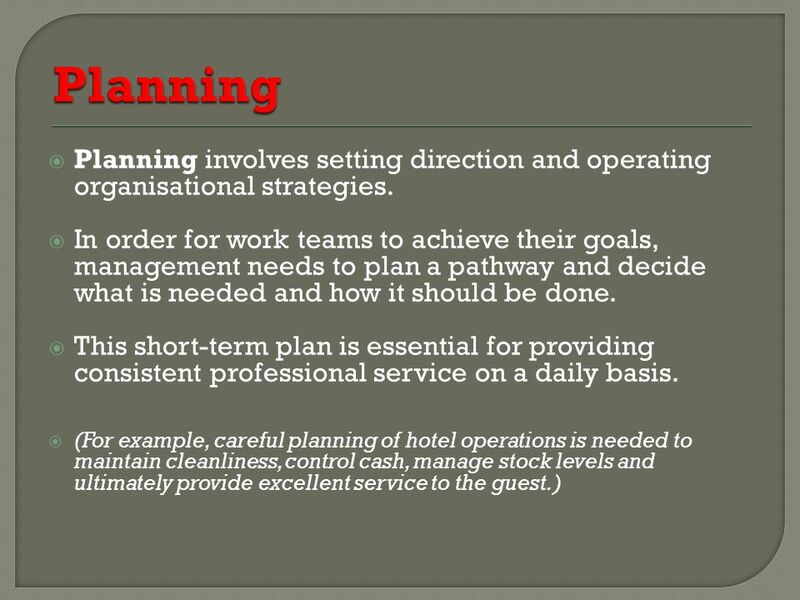 Good organisation ensures that every task is performed effectively and efficiently. 45 Cont. 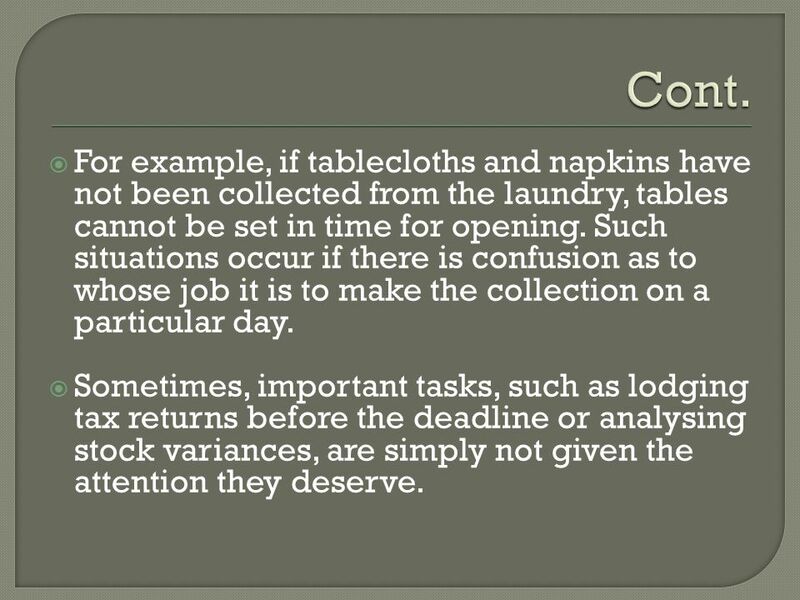 For example, if tablecloths and napkins have not been collected from the laundry, tables cannot be set in time for opening. Such situations occur if there is confusion as to whose job it is to make the collection on a particular day. Sometimes, important tasks, such as lodging tax returns before the deadline or analysing stock variances, are simply not given the attention they deserve. 46 Cont. 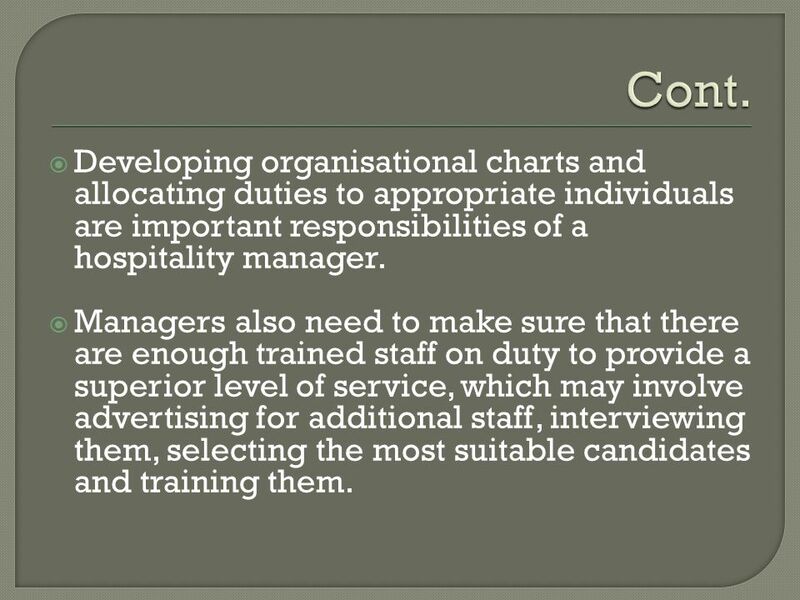 Developing organisational charts and allocating duties to appropriate individuals are important responsibilities of a hospitality manager. Managers also need to make sure that there are enough trained staff on duty to provide a superior level of service, which may involve advertising for additional staff, interviewing them, selecting the most suitable candidates and training them. 47 3. 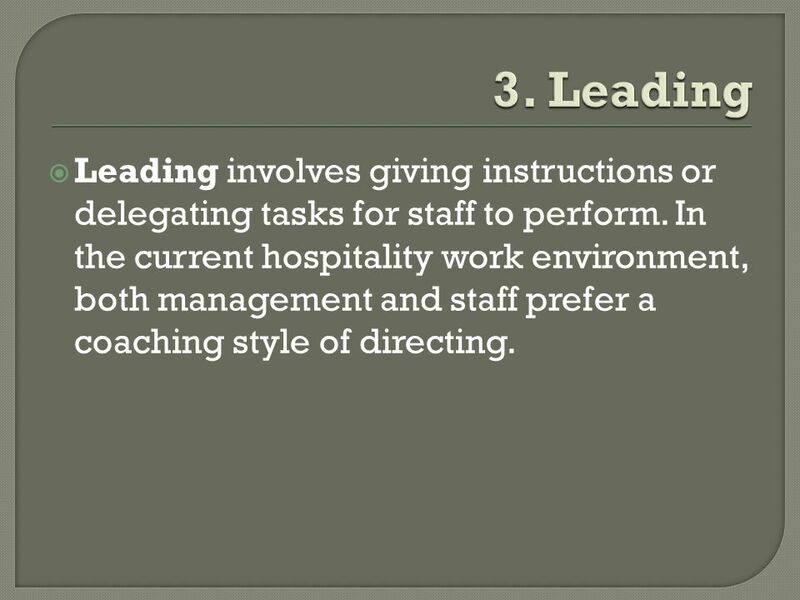 Leading Leading involves giving instructions or delegating tasks for staff to perform. 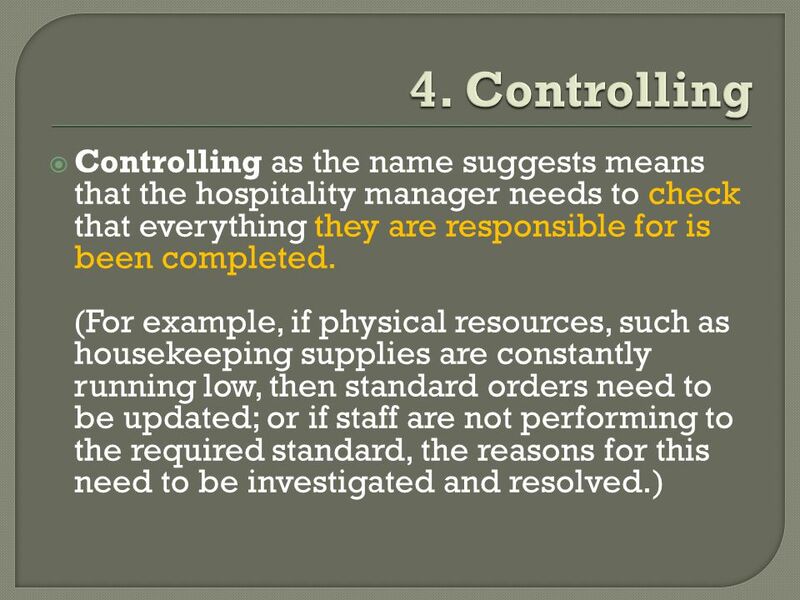 In the current hospitality work environment, both management and staff prefer a coaching style of directing. 49 Cont. 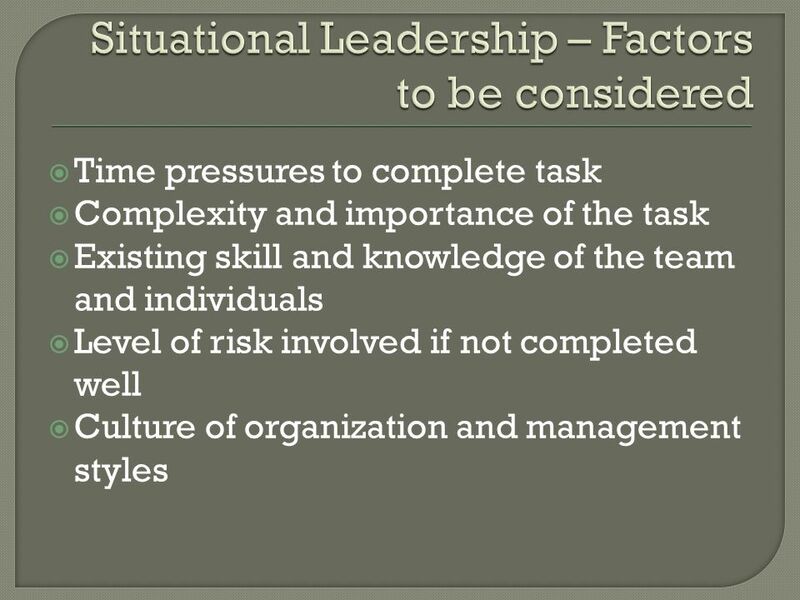 Managers need to carefully balance these functions. 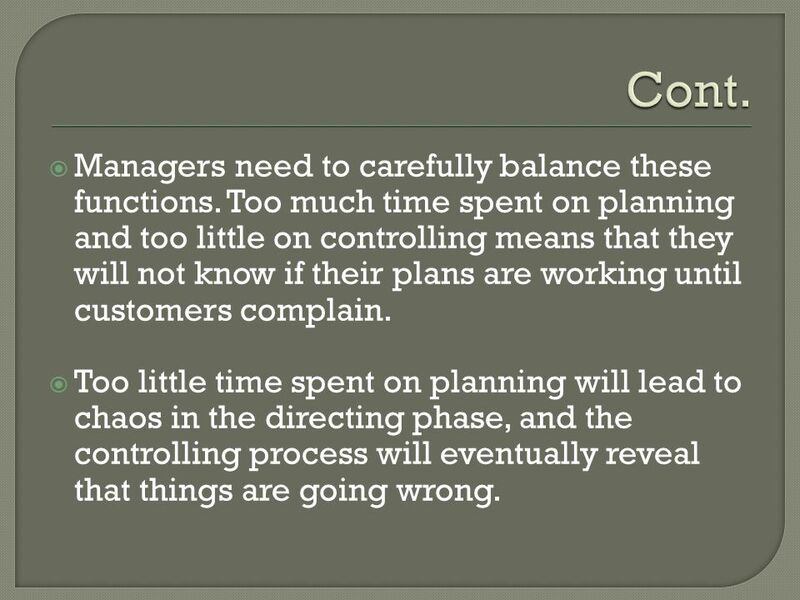 Too much time spent on planning and too little on controlling means that they will not know if their plans are working until customers complain. Too little time spent on planning will lead to chaos in the directing phase, and the controlling process will eventually reveal that things are going wrong. 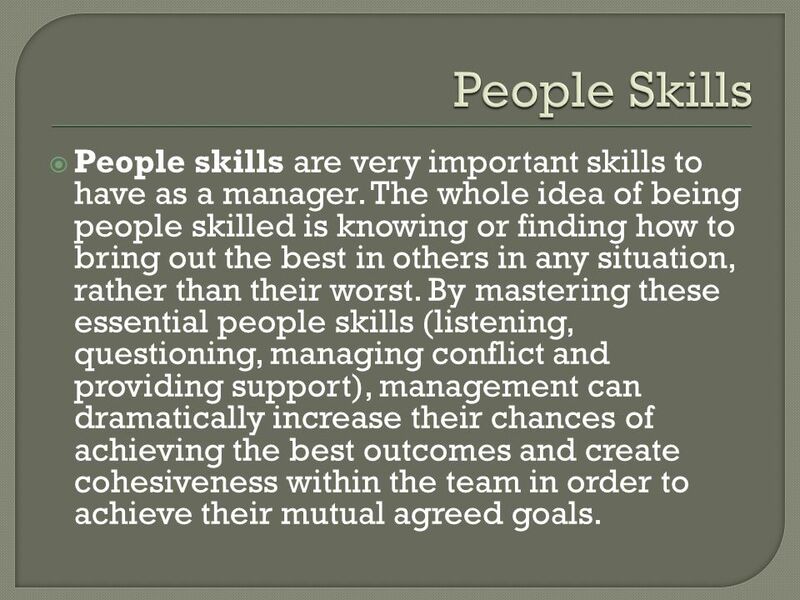 53 People Skills People skills are very important skills to have as a manager. The whole idea of being people skilled is knowing or finding how to bring out the best in others in any situation, rather than their worst. By mastering these essential people skills (listening, questioning, managing conflict and providing support), management can dramatically increase their chances of achieving the best outcomes and create cohesiveness within the team in order to achieve their mutual agreed goals. 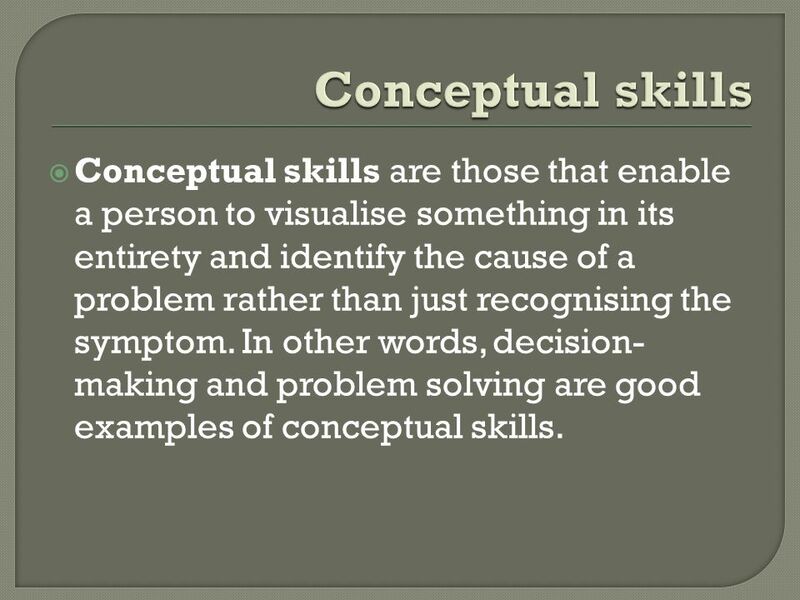 54 Conceptual skills Conceptual skills are those that enable a person to visualise something in its entirety and identify the cause of a problem rather than just recognising the symptom. 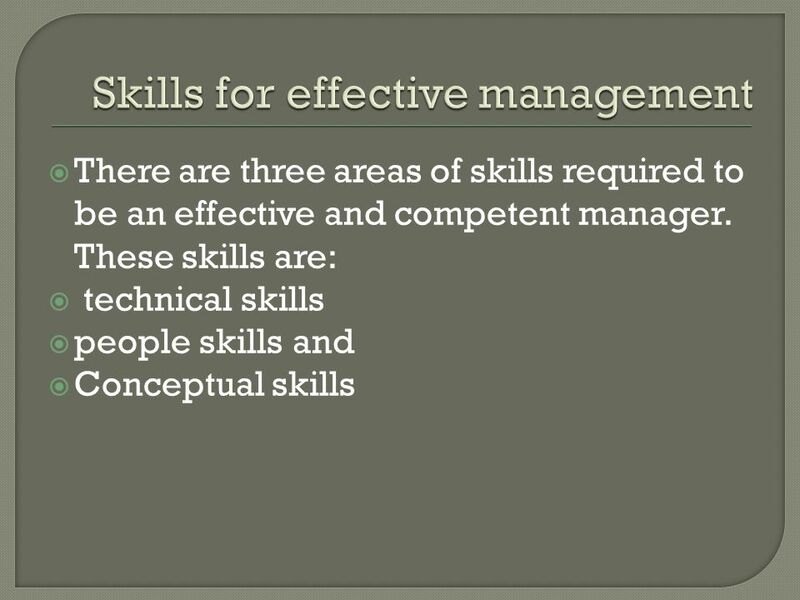 In other words, decision-making and problem solving are good examples of conceptual skills. 55 Cont. 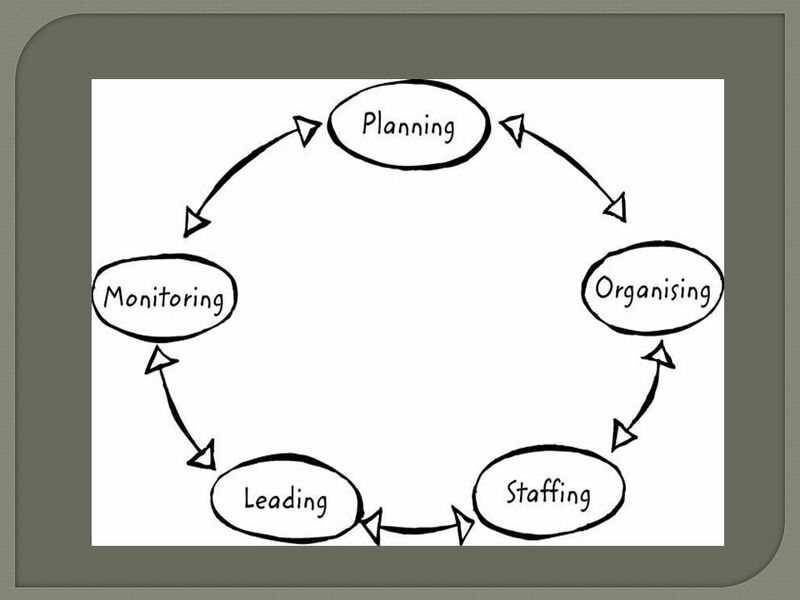 Managers do a lot of thinking, especially when planning or analysing why things are not performing as expected. 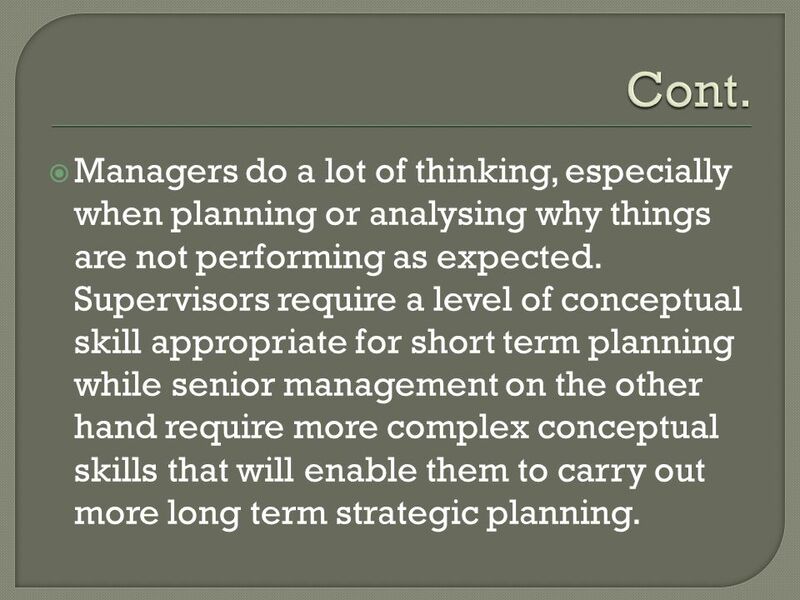 Supervisors require a level of conceptual skill appropriate for short term planning while senior management on the other hand require more complex conceptual skills that will enable them to carry out more long term strategic planning. 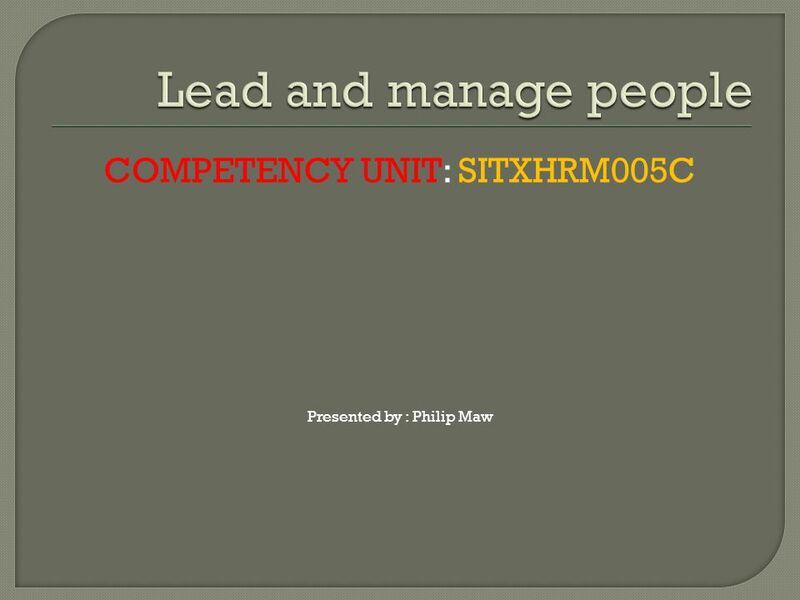 Download ppt "Lead and manage people COMPETENCY UNIT: SITXHRM005C"
This leadership style starts with the idea that team members agree to obey their leader when they accept a job. The "transaction" usually involves the. Defense Acquisition University –South My Leadership Style Lunch n Learn Series 17 September 2014 Presented by Mark Unger APM Department Chair, DAU-South. 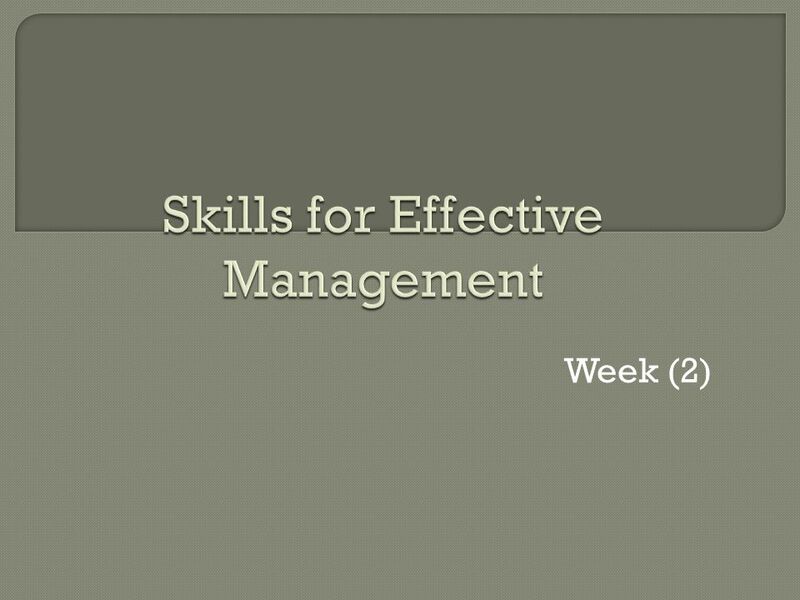 Building Human Resource Management Skills National Food Service Management Institute 1 Effective Leadership and Management Styles Objectives At the completion. 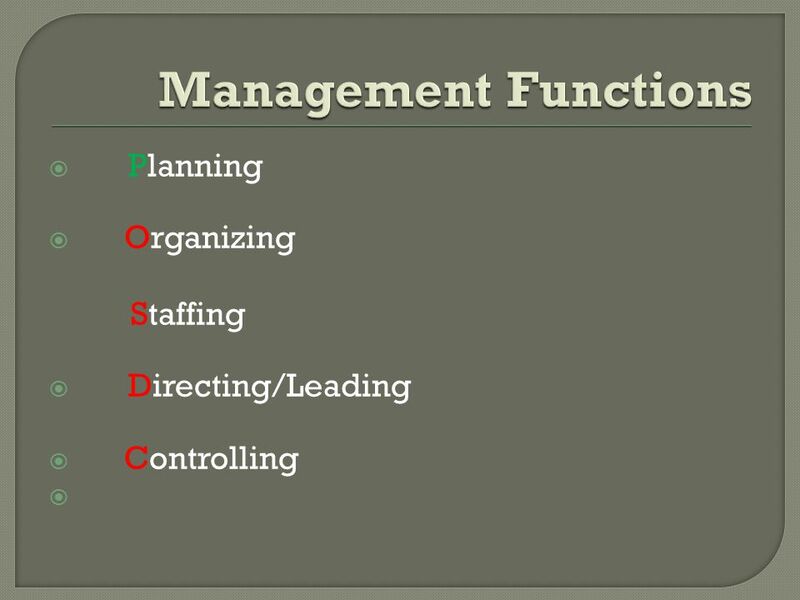 Levels of management Functions of managers Managerial skills Management styles Management. 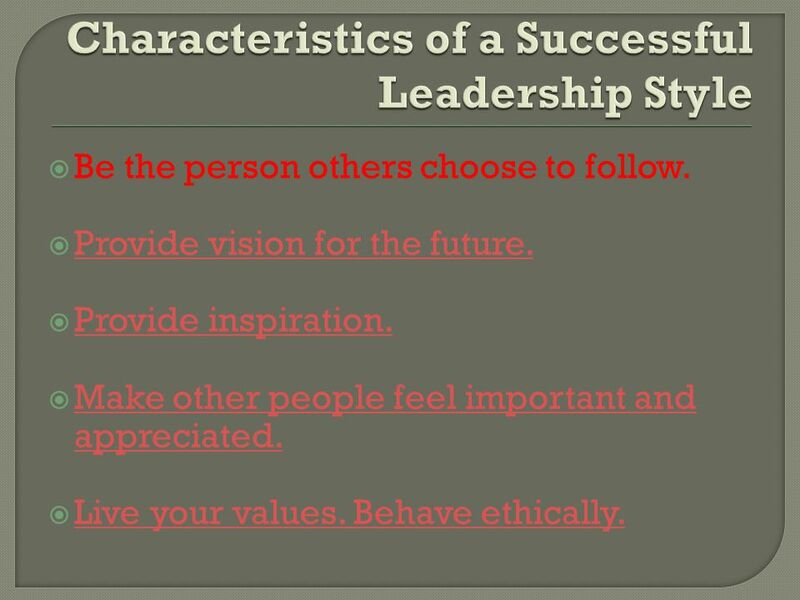 Leadership styles By: Gabija Pelikšaitė.